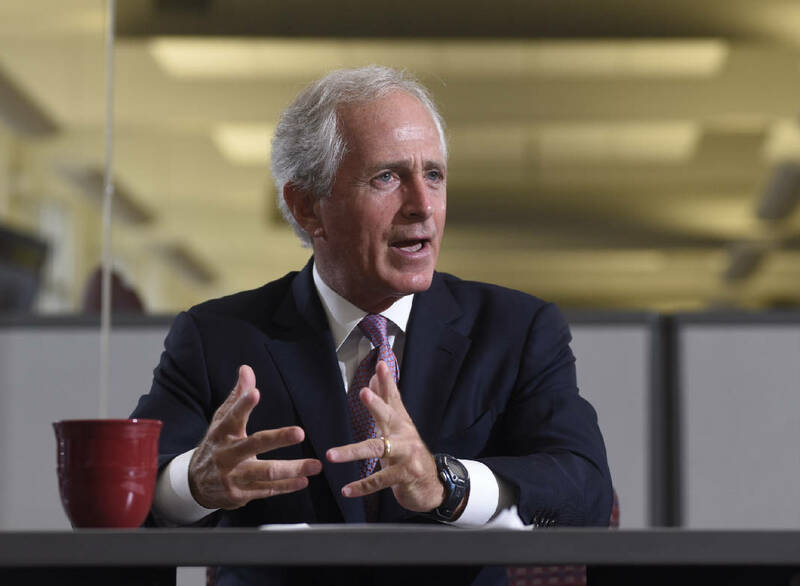 U. S. Senator Bob Corker meets with members of the Chattanooga Time Free Press editorial board Wednesday, Aug. 19, 2015, in Chattanooga, Tenn.
Photo by John Rawlston /Times Free Press. POLL: Should Bob Corker serve in Donald Trump's Cabinet? The rural south liked Trump more than Romney. Here's why. 'Not my president:' Trump denounced in protests across U.S. Ex-CIA chief: Flynn's firm discussed removing cleric from U.S.
Trump sends top aides to Mexico amid deep strains with U.S.
South Carolina Gov. Haley resigns to become U.S. ambassador to U.N. In Rep. Tom Price's district, what happens after Obamacare repeal? NASHVILLE - U.S. Sen. Bob Corker, R-Tenn., said he spoke Wednesday with President-elect Donald Trump and running mate Mike Pence but emphasized they did not discuss the possibility of the Chattanoogan becoming eligible for a cabinet post. "I know my name's being bandied about a little bit" in public, said Corker, a Trump supporter who as chairman of the Senate Foreign Affairs Committee had given the then-GOP nominee advice and acknowledged publicly at the time that he could be interested in a job as Secretary of State in a Trump administration. The former Chattanooga mayor said he spoke with Trump following the now-president elect's upset victory Tuesday over Democrat Hillary Clinton in the presidential election. "Again, they [Trump and Pence] have a group of people working on both ends of things," Corker said. "It's way to early for me to have any knowledge of what it is they're seeking regarding the key positions that have to be put together." Corker evaded a question about whether he would be interested, saying, "Well look, I mean, conjecture is bad for your health. Responding to conjecture is bad for your health." Meanwhile, Republican Gov. Bill Haslam, who would be responsible for naming Corker's replacement if the senator resigns his seat to join the administration, said earlier Wednesday he is getting flooded with calls and contacts from people about a potential vacancy if Corker goes over to the executive branch. "That's jumping to a lot of conclusions, obviously," Haslam told reporters about a Senate vacancy. "I'll say this: The country would be well-served to have Sen. Corker in a nationwide role. No. 2, I haven't started down that path because there's a lot of ifs in there. "No. 3, just as a funny aside," Haslam added, smiling, "I have started getting a lot of calls and emails about the position." Asked who had contacted him, Haslam replied, "it's 25 people." As for whether he might appoint himself to any would-be vacancy, the governor said, "I don't think I would do it for myself." In the event there were a vacancy, Haslam said, "there's two routes. You can pick somebody who's clearly going to be a caretaker and say 'I'm going to do it for two years until the election with no intention of running.' Or, somebody that thinks they might do it longer-term. I haven't crossed that bridge. "I probably would lean more toward somebody who's going to be a caretaker," Haslam said. Corker dryly noted the governor had spoken with him about the contacts and that he planned to tell reporters. While Tennessee is all a twitter about a potential Corker selection as secretary of state, NBC, citing unnamed sources, said that former U.S. House Speaker Newt Gingrich, R-Ga., was being considered for the post. Trump is interested in loyalists and Gingrich served the nominee well in an attack role. Asked about Gingrich being considered, Corker said, "I really have no idea, I don't. I just would have no way of knowing when these stories come out about who they're looking at. I know they [Trump transition team officials] are begining to look at those things." "We have no idea at present who they have on their list," Corker said. "Again, I know our name has been bandied around some. But we just have no knowledge of what is real or what isn't real, who's being considered for what position." Corker said he has learned "that in many cases some of the press reports that have come out are, you just have no way of knowing the accuracy of those." During last summer's GOP convention, Corker told The Tennessee newspaper that he might also have an interest in the Secretary of Treasury post. After Trump won the nomination, Corker was under consideration as the then-presumed nominee's vice presidential running mate. The senator visited Trump at the billionaire businessman's self-named Trump Tower in New York and later flew with Trump to South Carolina where Trump introduced the Tennessean and Corker briefly spoke. He announced he was withdrawing his name from consideration, saying he didn't feel suited for the demands on the running mate, which often involve attacking the other campaign. Corker said "the only thing that's in front of me at the present is the role I play on the Foreign Relations Commitee and we'll be working on agenda items," as well as banking, economic issues, the nation's financial shape and other areas in which he is interested. One thing became clearer for Corker as a result of Tuesday's election. Republicans were expected to lose the U.S. Senate and Corker's chairmanship would have evaporated in the new Congress. But Senate Republicans held on to their majority, albeit a slimmer one, thus Corker is in no danger of losing the chairmanship. Correction: A previous version of this story stated Corker met with Trump and Pence. Corker talked to Trump and Pence on the phone. The Times Free Press regrets the error.